The list of medical uses for marijuana (Cannabis Sativa) continues to grow. The Journal of Natural Products recently published a paper outlining the newly isolated antibiotic effects of the class of molecules known as cannabanoids. This group includes the non-psychoactive cannabichromene, cannabigerol, and cannabidiol but also includes the well-known and definitely psychotropic tetrahydrocannabinol (THC). Researchers believe that the powerful antibiotic effects of cannabanoids can be enlisted in the increasingly difficult fight against MRSA (Methicillin-Resistant Staphylococcus Aureus) and other ’superbugs’ that have evolved resistances to most modern antibiotics. MRSA is perhaps the best known of these superbugs, often running rampant in hospitals, with estimates of up to 1.2 million hospital patients becoming infected and possibly over 100,000 patients dying each year in the United States due to lack of effective medicines against them. The known effectiveness of cannabanoids and the fact that they have not been used before, and therefore no bacteria has yet developed a resistance to them, could prove to be a very valuable tool in the arms race against these constantly changing bacterial strains. In some ways the notion of cannabis having antibiotic effects is counterintuitive. This is because it has been proven that the act of smoking marijuana actually increases vulnerability to infections. This vulnerability however seems to be a result of inhaling marijuana smoke or even smoke in general and likely has little to do with the presence or absence of cannabanoids. Contrastingly, cannabis sativa itself, when not smoked, has been known since the 1950s to have strong antibacterial properties. However, as the technology of looking into how molecules are structured and how they interact was in its infancy at the time, the researchers were unable to determine which marijuana compounds were actually causing the antibacterial effects. As the social and research climates started to grow increasingly hostile to the investigation of black-listed substances in the US and around the world, antibiotic cannabis studies were soon shelved and ignored until they were finally picked up again fairly recently by modern science. With all of the advances in chemical analysis made since the fifties, the new batch of scientists studying cannabis related antibiotics were now able to pinpoint the basic backbone structure that is common to all cannabanoids, to be the active component in killing off bacteria. Now that the bio-active section of the cannabanoid molecules has been identified, researchers and drug makers are busy developing and testing antibiotic drugs as well as considering potential uses for cannabanoids in various soaps and cleaning products. At present they are focusing their efforts on the derivatives of the non-psychoactive cannabanoids. This is presumably because the US FDA, and other governing bodies world-wide, might have a hard time with people getting high in order to cure a bacterial infection; not to mention getting high by just washing their hands. 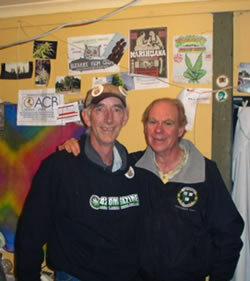 While I was in Nimbin recently at the 2008 Mardi Grass, I had the opportunity to sit and blow a joint with Ed Rosenthal (pictured right, I’m on the left, Ed on the right). We got to talking about Terpenes, with particular regard to a chapter in Ed’s latest Book, “The Big Book of Buds Vol. 3”, called ‘The Secret Chemistry of Cannabis Odors and Highs’. The discussion led to a Terpene known as Myrcene, which is the most prevalent Terpene found in most varieties of Cannabis, but not found in hemp. It is also present in high amounts in mangos, hops, lemon grass, West Indian bay tree, verbena and the plant from which it derives it’s name; Mercia. Myrcene appears in small amounts in the essential oils of many other plants. Its odour is described as clove-like, earthy, green-vegetative, citrus, and fruity with tropical mango and minty nuances. Without going into too much detail from the book, Ed explained that the presence of Myrcene was an important factor in the quality and enjoyment of the high from smoking certain Cannabis strains, particularly those strains that came from tropical climates…namely Sativas. Ed went on to tell me that it was possible to enhance the quality of the high from a low potency bud, through the addition of Myrcene. He went on to say that this could in fact be tested and verified. And this is how he told me to do it. Say I had a nicely grown bud that was lacking in the ‘Zing’ department when smoked. If I was to eat a Mango one hour before smoking the bud, Ed said the addition of Myrcene to my body from the mango, would have a profound impact on the quality of the high, and I would notice the ‘Zing’ that was missing, had I just smoked the bud without having eaten the mango. Yes folks, you heard it here. You can improve the quality of the high from a bud you smoke, if you eat a fresh mango ONE HOUR before smoking! So, how do we use this information to help us further, so that we can improve the quality of our high, or maximise the medicinal benefits of our cannabis. Well, first up is to make sure that you ALWAYS inhale the aromas and perfumes PRIOR to smoking or vaping your buds. You do this by breaking up, or chopping up your bud prior to consumption. This releases the volatile terpenes in the bud when you rupture the resin glands. If you then inhale deeply through your nose and wait at least 5 minutes, you will maximise the benefits from that bud. To show how this works in practice, all of you will have seen reports from police that their officers have gotten ‘high’ when seizing ripe cannabis in large quantities from a grow room. The police are not actually high, but they are in fact affected by the terpenes released into the air as they handle the cannabis. The two most prevalent terpenes giving this reaction are Myrcene and Geraniol. The police are relaxed and somewhat sedated, but they are NOT high. You will also notice this effect when manicuring your cannabis at harvest time. I know a lot of purists will nay say about breaking a bud up prior to smoking, but I can assure you that they would get a better benefit if the chopped and inhaled first. Check back in the future for more articles from The Medical Mark.